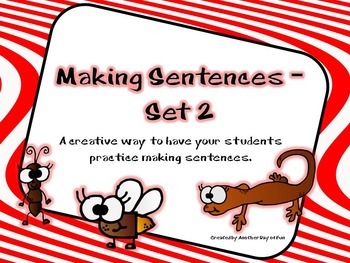 Are your students ready to create sentences? Would you like them to enjoy making sentences? This is the set for your students then. It allows them to spin a subject, add a predicate from the pre-printed cards. They then combine them on the included printable worksheets so that they can create a full sentence. It also allows for them to identify the subject/noun and the action/verb of each sentence in a guided manner. 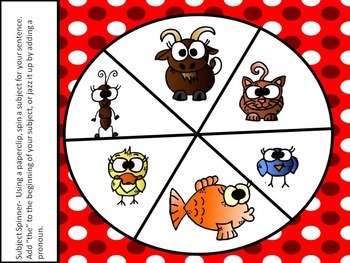 There are 2 types of predicate cards and subject spinners to allow for differentiation of your writers. One set has picture clues to help your emerging readers, while set two does not. 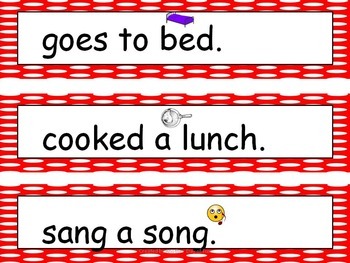 The sentences become rather silly upon their combination and make writing more fun!The combined sentences will have your students smiling as they write sentences such as "My moose kicks the ball." and " My ant climbed a mountain." Please feel free to use this in your personal classroom. It is not for use commercially without expressed written consent from the author.